This author Valarie Vorpagel has created 16 entries. On Monday, June 27th, four members of the Guardians of Justice traveled into idyllic Eustis to visit Camp Boggy Creek. Boggy Creek is a week-long summer camp that seeks “to foster a spirit of joy by creating a free, safe, and medically-sound camp environment that enriches the lives of children with serious illnesses and their families.” And from their sprawling campus to their cheerful volunteers they truly do just that! Gabby and Connor are two of those cheerful volunteers who escorted our he roes via golf cart to the camp’s mess hall for a breakfast visit with the children. In the morning of May the 27th a handful of members of the Guardians of Justice stopped by Bright Start Pediatrics for Super Friday! This not so ordinary Friday is a yearly event where patients and staff get to celebrate being super by dressing up and having fun! 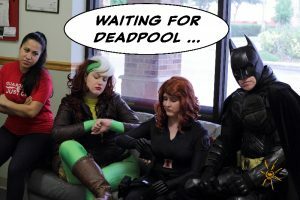 Our visit was off to a rocky start as three heroes and their Smile Maker, Vanessa, waited for what seemed like forever for Deadpool to finished getting ready. As you can see from the photo, we were not amused. 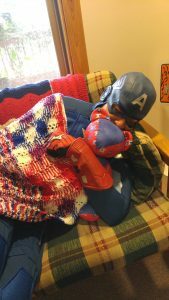 Once Deadpool arrived everyone headed to the infant room to spread some smiles! We Made it – Watch us now!!! With our organizations one year anniversary (since relaunching in April of 2015) came an amazing and exciting new development: Guardians of Justice is a federally recognized 501c3 nonprofit organization. What does this mean for our Volunteers? Volunteers who itemize their taxes can speak to their personal accountant about eligible deductions for attending our events. Including mileage! What does this mean for our Sponsors? Sponsors who make contributions can now deduct those contributions from their Federal income taxes. Because we are now 501c3 accredited we can open ourselves up to accepting partnerships with corporate sponsors as well as accepting contributions from local businesses and individuals. 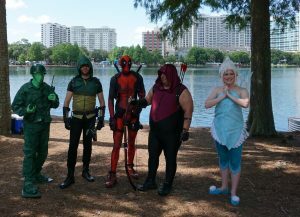 On Saturday, April 9th characters from Guardians of Justice joined the Autism Society of Greater Orlando for their Autism Walk & Family Fun Day at the Orange County Convention Center. Participants in the 5K walk had to circle the North Concourse nine times (that’s a LOT!) to complete their pledges. During opening ceremonies the Guardians were joined by puppeteers to listen as sponsors were thanked and awards were announced. The Orange County Sheriff’s office Honor Guard presented the colors as a wonderful rendition of the National Anthem was given by two young participants. 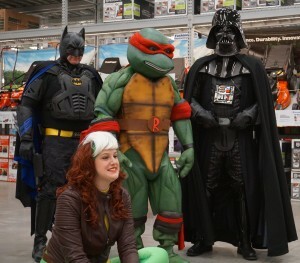 Right next to the lawn mowers and across from the light bulbs isn’t usually where you’d expect to find a group of unlikely allies but on Saturday, February 27th at the Lowes of Auburndale, that was exactly where a few members of Guardians of Justice could be found. 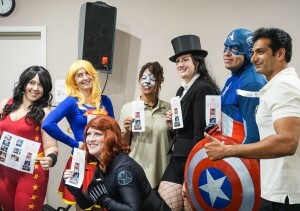 We were so happy to be invited back for our second See a Hero, Be a Hero event.